Bell-bottom jeans are coming back in a big way. Celebrities like Katie Holmes, Kim Kardashian and Victoria Beckham have all been recently photographed by papparazi, clad in a reincarnation of the popular sixties/seventies denim cut. Even celebrity stylist and glamazon, Rachel Zoe swears by them. So what makes bell-bottoms so endearing that it seems like fashion designers can’t help but bring them back every other season? It’s because they’re flattering for most body types. The wide width of the “bells” at the bottom balance out the hips therefore creating the illusion of a narrower hip and waist. 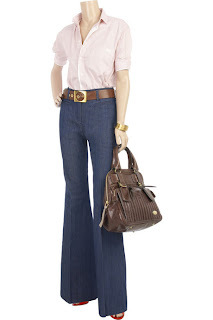 Bell-bottoms also give the “height-challenged” woman an opportunity to hide their heels and look taller for real. The new bell-bottoms seen on the runways of Miss Sixty, 7 For All Mankind and Dolce & Gabbana, have a higher waist as compared to its big sister in the nineties. Another significant difference from it’s predecessor is that the majority of the new flares available in the market today sport an ultimately distressed look from frayed hems to multiple holes along the thigh and knee-cap areas. On the contrary, fashion designer Phillip Lim chose to create his version of the flare in striking burnt umber and silk instead of the typical denim for his 3.1 Phillip Lim fall 2010 runway show. Now how to wear this trend without looking like a bad Elvis impersonator? Take your cue from young Hollywood. Hillary Duff, Lindsay Lohan, and Mischa Barton like pairing it with tank tops and plain, form-fitting tees, accessorized with bright scarves or a medium width belt. Rachel Bilson and Keira Knightley on the other hand, prefer to wear their flared denims with a sheer or floral blouse and well-tailored, button-down oxfords for a more feminine and preppy take on the trend. For the more daring fashionista who prefer to stand out rather than blend in with the crowd, grab yours in a fun color like supermodel Agyness Deyn. Just like disco, bell-bottoms are here to stay. Put those constricting skinnies of yours on the back burner and grab yourself a groovy pair. Start embracing your curves once again. The funk is back ladies. Dig it? Peace.